PaySafeCard ransomware is a malware that encrypts user files with the AES encryption and renames them with the .rnsmwre extension. The virus appears to be completely new as no code samples from any of the famous malware families have been identified. Victims can follow our in-depth removal guide to eliminate existing infections. How Does PaySafeCard Ransomware Infiltrate the System? PaySafeCard Ransomware was found to attack computer users worldwide. The virus is distributed in a small-sized campaign and at the moment the specialists cannot determine the preferred delivery method. As such we suspect that the most popular methods are used. Email spam messages that use social engineering tricks are one of the most popular strategies. The hackers create fake messages that imitate well-known companies containing the PaySafeCard ransomware either directly or linked in the body contents. 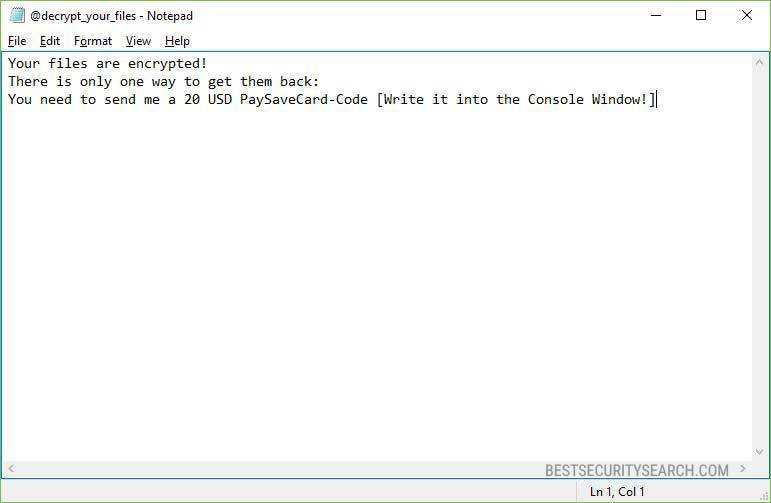 Another way to spread the PaySafeCard virus is to intergrate the malicious code into embedded scripts in office documents or software installers. The infections occur after the target has delibirately interacted with the file. They can be found on different hacked or hacker-controlled download sites and P2P networks like BitTorrent. Depending on the scenario the sites and trackers may pose as official download sources or places where pirate content can be found. The hackers can create special web redirects and other types of scripts that can be installed on various sites. When they are opened a redirection takes place that downloads the virus file to the local machine. Browser hijackers typically change the default settings of the popular applications (Mozilla Firefox, Chrome, Microsoft Edge, Internet Explorer and Safari) to redirect to a hacker-designated search engine or portal. Direct hacker attacks carrying the PaySafeCard ransomware virus as the primary payload are also possible. Computer security researchers detected a new virus threat called the PaySafeCard ransomware. It is being developed by an unknown hacker or criminal collective. The current iteration features only an encryption engine that targets a predefined list of target file type extensions. Like most popular viruses of this kind the PaySafeCard ransomware seeks to process as many files as possible. This can include all accessible documents, archives, photos, music, videos and etc. The .rnsmwre extension is used to mark all processed files. In comparison with other viruses the hackers do not demand the payment in Bitcoins, the preferred method is a PaySafeCard with 20 US Dollars. The PaySafeCard ransomware bears a fake copyright that makes it appear as being made by HP. WARNING! Manual removal of PaySafeCard Ransomware requires being familiar with system files and registries. Removing important data accidentally can lead to permanent system damage. If you don’t feel comfortable with manual instructions, download a powerful anti-malware tool that will scan your system for malware and clean it safely for you. WARNING! All files and objects associated with PaySafeCard Ransomware should be removed from the infected PC before any data recovery attempts. Otherwise the virus may encrypt restored files. Furthermore, a backup of all encrypted files stored on external media is highly recommendable.